After researching several books and articles, such as Arv Olson’s “Backspin” and various articles in “Fore” magazines, there appears to be confusion for the opening date for the Newlands G.&C.C. Recently, while searching through various club histories and our archives, we found a document outlining the early history of Newlands. From our records, it appears in the early 1990s, a former employee of Newlands probably from 1947 until 1950, visited the Museum. The following article is based upon the conversation we had with this individual. 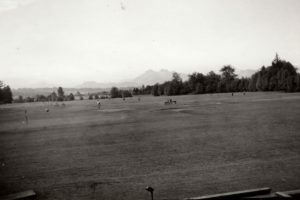 The employee also donated ten images of Newlands taken from 1948 to 1950. The article below is based upon this conversation and excerpts from various materials such as back issues of “Fore” magazine and articles from Langley newspapers. The Newlands G.&C.C. was founded by the late Dorothy and Clive Rogers, a retired Englishman from South Africa, who treated the land comprising the golf course as a private garden. In 1929, the couple arrived in Langley and purchased eleven acres from J. W. Berry. During the Great Depression, Rogers raised cattle, sowed oats, harvested wheat, and baled hay on the property. He joined the army in 1943. 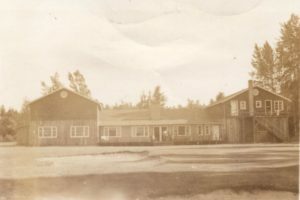 Upon his return to Langley in 1947, his focus for the property changed. He had a vision to create a golf course. To his original eleven acres, he purchased another twenty-eight acres from the Berry family. Construction for the course began in 1947. Interestingly, Rogers hired the retired Jericho C. C. professional, Alex Duthie, to layout the course. The Museum visitor stated Newlands opened in 1948. We have independently verified this opening date by searching the Langley Prairie City Directories. The 1947 directory gives no reference for the Newlands G&CC. But the 1948 issue lists the Newlands G. & C.C. Therefore, the course likely opened in the spring of 1948 prior to the collection of the information for the 1948 city directory in July. The original 9 holes were very crowded. Four fairways ran parallel to each other in front of the clubhouse (see image). In 1950, Rogers purchased an additional twelve acres from the Rooke family. This land fronted onto Berry Road on 208th Street. The course configuration for the four fairways in front of the clubhouse was reduced to only two. In 1950, few houses existed in the Brookswood area. Rogers removed trees from this area and planted them between the first and ninth fairways. Today, these original six-foot trees have grown into beautiful shade trees. In 1959, Rogers added the Stovell property to the course. He used this to create the second nine holes – three par fours and six par threes – total length 1760 yards. Although short for nine holes, the additional nine proved to be challenging and sporty. Shortly after their purchase in 1961 the new partners acquired the Prince Harris property, located immediately south of the Rooke property. This addition enabled the partners to create a practice fairway for the course. In 1971, a further property acquisition near the Harris property extended the length of the short back nine. In 1961, the Rogers family sold the course to Spence Forshaw and Raoul Anderson. After serving as a silent partner for almost a decade, Spence Forshaw, sold his interest to Raoul. After acquiring sole ownership, Raoul Anderson directed his efforts towards a new clubhouse. To accomplish the task, he acquired the McTaggart property located near the original east boundary of the golf course. When the original Rogers house and an acreage became available, Anderson added it to the golf course property. In 1984, Anderson undertook a complete rebuild for the golf course. He hired American golf architect, W. L. Overdorf, the Iron Mountain designer, to create the new course. Congratulations to Newlands on their 70th anniversary. The Museum is constantly on the search for any memorabilia for our early golf courses.